In recent years, sales of fair trade products have grown in leaps and bounds, especially in Europe where support from both consumers and governments has been strong. While this growth is encouraging, supply from producers in the Global South is well ahead of demand from consumers in the North. Large quantities of fair trade goods are not being sold on fair trade terms. For example, about two-thirds of fair trade coffee is sold to conventional buyers or local markets, where producers generally get far less. Because of this lag, fair trade producers miss out on the full benefits of fair trade. How do we close this gap? We do it by building demand. If consumers in the North request and buy fair trade products, fair trade producers can sell more of their goods on fair trade terms and receive the maximum benefits of the system. These benefits include a guaranteed minimum price and an additional premium, as well as the opportunity to decide how to invest that premium. It is a practical way to change the world for the better. With sustainable public procurement, public institutions can increase the demand for sustainable products, support environmental, social and ethical practices, and contribute to sustainable global development. 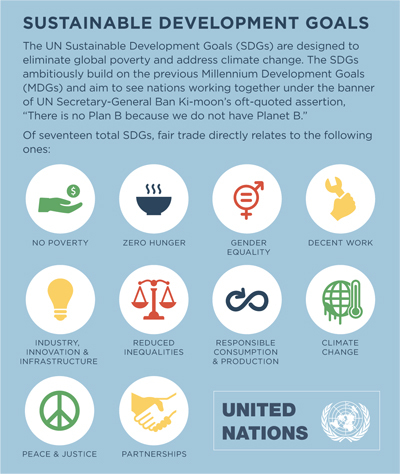 Furthermore, by developing sustainable procurement policies, procurement managers can align their work with the UN’s 2030 Agenda and support its Sustainable Development Goals (SDGs) to build a future of prosperity and dignity for all (see sidebar). By purchasing sustainably sourced goods, governments can lead by example and deliver key policy objectives by reducing greenhouse gas emissions, improving resource efficiency and supporting recycling. From an economic perspective, sustainable public procurement can generate income, reduce costs and support the transfer of skills and technology. When aligned with established fair trade certifications, sustainable public procurement can reduce poverty, support trade equality and promote respect for core labor standards. Public spending, which accounts for an average of 12% of Gross Domestic Product (GDP) in developed countries and up to 30% in developing countries, wields enormous purchasing power. Shifting that spending toward more sustainable goods and services can help drive markets in the direction of innovation and sustainability, thereby enabling the transition to a green and fair economy. Create the Policy: Introduce a fair trade public procurement policy that effectively communicates the sustainable procurement objectives to the public, staff and suppliers. Implement the Policy: Mandate the use of fair trade products in all offices and managed food service outlets. Public festivals, fairs and other local initiatives or events should be considered as well. This mandate should contain commitments to specific fair trade products and timelines. Educate: State how the commitment to fair trade will be enforced and how relevant staff will be given appropriate training. Create a local sustainable procurement taskforce that includes experts on fair trade, international social justice, local employment, local economic development, the environment, the climate and procurement. Take a holistic approach in developing a sustainable procurement policy. Partner with local fair trade actors (producers, organizations and civil society) to organize awareness-raising and capacity-building initiatives which encourage and assist procurers with including fair trade criteria in their procurement process. Join networks that promote sustainable public procurement to stay up to date on examples of best practices and policy initiatives that support sustainable procurement and fair trade. Programs such as Fair Trade Towns, Campuses, Schools and others should exist to engage with the public, the business sector, and different levels of government and various public institutions. The core objective of these programs is promoting fair trade and sustainable public procurement. In Canada, we are engaging our federal government directly. Our Fair Trade Town groups have worked with various municipal governments, and our student groups have partnered with universities and colleges across our nation. We have seen policies adopted with real results (see footer). We are seeing fair trade brands replacing non-fair trade options, and a considerable volume of product is now being sold through governments and institutions. This impacts local businesses and, most importantly, the producers and cooperatives from whom they purchase. Sustainable public procurement aligns the power of government purchasing with recognized and effective efforts to address climate change and end global poverty. By adopting sustainable public procurement policies, public institutions, local authorities and various levels of government can take the lead and create meaningful and lasting change both locally and globally. It is a way to boost demand for fair trade products so that producers in the Global South can access the full benefits of a system they have worked so hard to build. From May of 2015 to May of 2016, SFU sold over 18,000 pounds of fair trade certified coffee through its dining service locations. In 2016, UNBC’s student union coffee shop sold over 20,978 cups of fair trade certified coffee and 6,600 cups of fair trade certified tea. 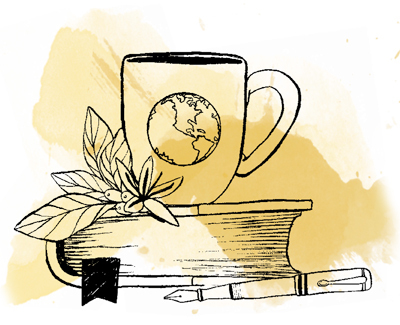 In 2015, McGill sold $237,274 of fair trade coffee, tea, chocolate, bananas and cocoa. McGill launched its own fair trade certified coffee blend, Roddick Roast. The beans come from a cooperative of 1,091 organic and fair trade certified farmers in Chiapas, Mexico. In 2016, Vancouver-based coffee roaster Ethical Bean provided 22,890 pounds of organic and fair trade certified coffee to three of Canada’s Fair Trade Campuses.